(partial) Volume 1: Field 1: Photovoltaic energy: Workshop: Photovoltaic converters (Crystalline solar cells). Thin film solar cells. Field 2: Solar Thermal Energy Conversion. Energy conservation in buildings. Test procedures and standards for collectors and systems. Solar active cooling systems. Volume 2: Air heating collectors and systems; thermosiphon systems. Central solar heating plants; long term thermal storage systems. Solar drying. Field 3: Wind energy; Workshop: Research and development, system engineering. Research and technology. Design concepts and operational experiences. Field 4: Heat pumps: Workshop: Small standard heat pumps for domestic applications. Heat pump systems with solar assistance/seasonal storage. Air and water source heat pump system. Volume 3: Field 5: Biomass technology: Workshop: Production of energy carriers. Biological processes. Thermal processes. Field 6: Use of solar energy in developing countries: Workshop: Pumping. Promotion of solar energy, education, management and energy planning. Solar energy resources assessment. Field 7: Solar chemical conversions: Workshop: Thermochemical conversions. Electrochemical processes; photochemical processes. Volume 4: Field 8: Passive solar energy/solar architecture: Workshop: Passive solar architecture and thermal comfort. Passive cooling and related topics. Field 9: Meteorological aspects of solar energy: Meteorological aspects of solar energy I. Meteorological aspects of solar energy II. Field 10: General aspects; market, economics; miscellaneous topics. Farrington Daniels award lecture. Author index. 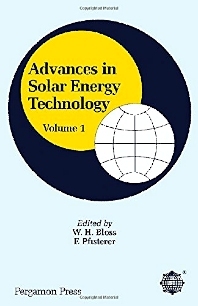 Published in association with the International Solar Energy Society, this four-volume set focusses on the latest research and development initiatives of experts involved in one of the fundamental issues facing society today: the global energy problem. For energy technologists, materials scientists, environmentalists and architects.